Landis+Gyr FTU2 multi-purpose ripple control receiver offers maximum flexibility for utilities to manage tariffs, control public lighting, decentralized loads and generation for grid and energy management. The FTU2 covers a wide range of applications from simple remote switching of relays to complex autonomous switching and time functions. 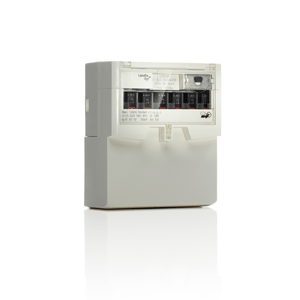 Depending on the device type, up to six 25A changeover switches or 40A relays can be plugged-in and individually parameterized via interpreter programs to cover installation diversity. Remote parameterization ensures operational efficiency and increased flexibility for future optimizations. The frequency-dependent load shedding functionality is freely parametrizable and actively contributes to ensure power supply quality during power grid congestion. The FTU2 supports easy and efficient reception frequency change in the network: two different reception frequencies are saved in the receiver, allowing a smooth frequency changeover via a simple ripple control command. The device may also be used as calendar time switch without ripple control system.